UWC students believe no one cares about them. Almost nothing about their severe trauma this past week has been reported in the media. Most of the news focuses on historically white universities. Yet 25 UWC students are currently in jail, some of them in Pollsmoor Prison. This is a statement of what I observed and witnessed at the University of the Western Cape (UWC) on Thursday 20 October 2016. I am a postdoctoral researcher at UWC, a white person, from a relatively privileged background in South Africa. On Wednesday evening I read a post on social media that “police are on campus chasing students out of residences and that shots have been fired in the residence block”. Apparently student protests had intensified during the day. That evening police who had been gathering throughout the afternoon began firing on students with stun-grenades, tear-gas, and rubber bullets, and making arrests. 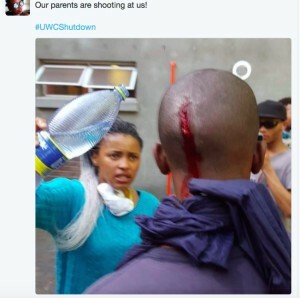 All students on campus, including students who do not support #FeesMustFall, were affected. 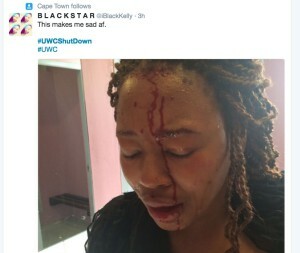 There were social media reports of police calling students “k****rs”, and of a coloured journalist telling black students to “go back to Africa”. 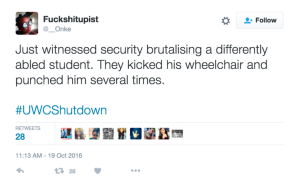 Twitter users alleged that a differently-abled student had his wheelchair kicked over by police and he was punched several times. 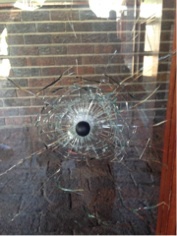 According to social media reports, a young woman was allegedly shot in the face, simply for looking out of the window. 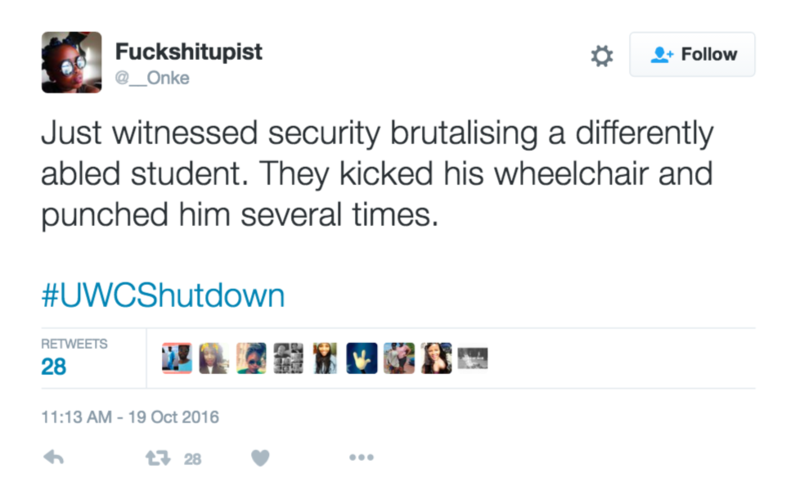 Another student allegedly had his arms broken by police. From the reports I received on social media, police then denied ambulances access to UWC, claiming it was illegal for them to enter. I began sending tweets offering to fetch students from campus and to give them a safe space for the night. A colleague managed to fetch two students who had escaped from campus and were standing alongside the road. One of the students was blind. Both were severely traumatised. 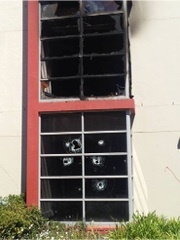 The students I made contact with were by that time lying low and too scared to leave their rooms as they said that anyone who was walking around campus was being shot at. After an uneasy night, I left for UWC the next morning, with the aim of taking food and medical supplies for students. A crowd of young people, mainly young women, and a staff member with a carload of food for students, had gathered outside the university gates. Security officers had been given orders not to let us in. Student leaders, one of whom I know personally, began negotiating with security. The young women were not to be stopped, however, they began climbing over the gate. After that the security guards relented and let us in. What I encountered on campus was shocking, particularly to someone who has believed in the idea of universities as safe and sacred spaces for learning. It looked like the aftermath of a war zone. Bullet casings and tear gas canisters were strewn on the ground. 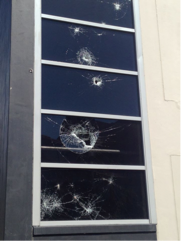 Windows were broken, buildings had been shot up. A room had caught alight. The students told me they had no access to that room, it was behind police lines so they were not sure how it had been burnt. I spent the day with the students, listening to their stories, helping them clean the campus, driving them to places they needed to go, and helping them move the food they had received from donors to a safe house. 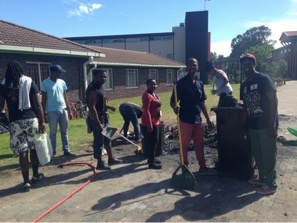 Many of the students were exhausted and all were severely traumatised, but they kept their spirits up by singing and even joking amongst themselves while they worked together to clean up the devastation of the night before. Young people are resilient that way, I remember thinking, this is how they survive, through keeping alive a sense of humour, camaraderie and an awareness of the absurd. Weirdly enough, they seemed on good terms with campus protection services. Some of the campus security members seemed apologetic about what had happened the night before. What struck me most of all was how young the students seemed. Many of them were still teenagers, others in their early twenties. They claimed that the social media posts I had read were true to the best of their knowledge. When I saw one of the UWC’s usually very well looked after feral cats running around crying, the students said that the cats had also been tear-gassed and suffered stun grenades. Being a cat lover, I was really upset to hear this. The students then asked me to please post about the cats on social media in order to draw attention to the situation at UWC, as they were aware that most white people would be more outraged about what happened to cats than to black students. Someone mentioned that the arrests seemed to have been random, as a young woman who is not a #FeesMustFall student was arrested simply because she was afraid and ran from her room to hide in the bathroom. Around 35 students were arrested in total. Friday was the hearing for the students who were arrested on Wednesday night. Some were released on bail but 25 remain in jail. I was horrified to hear that UWC students would be sent to Pollsmoor, a prison known for hardened criminals and also the most notoriously violent jail in South Africa. 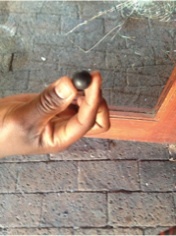 They arrived at Goodwood Prison and Pollsmoor on Friday afternoon. While we have had reports that the students there are ok, I am in a state of total disbelief and shock. The group of students I was with on Thursday at UWC are just young students like you might meet anywhere in the world, though they are more economically disadvantaged than most university students in the Western Cape. One of them was a member of the Pan Africanist Student Movement of Azania (PASMA), and openly gay, with a fabulous sense of humour. He taught me how to say “Izwelethu iAfrica” (“our nation, Africa”), and I also learned some UWC student slang such as “in that fashion”, a statement that can apparently be added to the end of a sentence or applied as a humorous response to virtually anything. One of the students is reading Zakes Mda’s Ways of Dying and says it’s her favourite novel. I will never see the students of UWC as “ugly” or as deserving of what has happened to them over the past few days. What I have seen are brave young people who should not be facing, alone, an apparently endless war on the youth of our country. – Lucy Valerie Graham (D.Phil. Oxford) is a postdoctoral researcher at UWC. She writes here in her personal capacity.